Shako 19th century. Napoleonic wars. Home » Shako 19th century. Napoleonic wars. 567 – Shako of the 5th French Hussars under Napoleon I. Order to 1812. Blue color, yellow border, yellow curtain. The 5th Hussar regiment fought at Austerlitz in 1805, 1809 at Eckmühl, Wagram, 1812 at Borodino, Berezina, 1813 in Leipzig, Bautzen, Hanau. 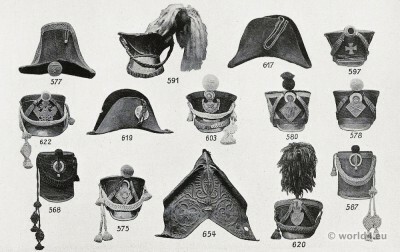 568 – Shako of the 8th French Hussars under Napoleon I. Order to 1812. Red color, black and red curtain. Cockade new. Beautiful piece in typical pot shape. Built in 1793. The regiment distinguished himself at Austerlitz, Lübeck, Eylau, Wagram, Vilnius, Borodino, Altenburg, Leipzig, Strasbourg, etc.. It was disbanded in 1814. 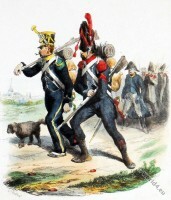 575 – Shako of the 7th Regiment of the French hunter on horseback under Napoleon I. Order to 1808. Fought in Belgium – Austria – Switzerland – Westphalia. 577 – Hat of an Austrian staff officer. Order to 1809. 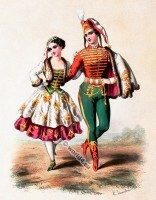 Typical Austrian High form enclosed with broad, ornamented gold braid. Without cockade. 578 – Shako of a sergeant from the Westphalian train horses under King Jerome of Westphalia. Order to 1812. With white braids and red pompom. 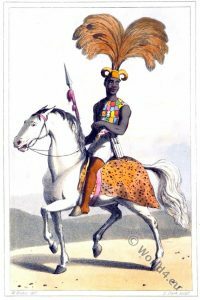 580 – Shako of a captain from the Westphalian train horses under King Jerome of Westphalia. Order to 1813. With silver braid and white pompom. 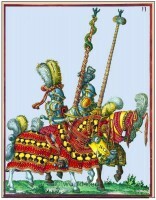 597 – Shako of the Pomeranian armed horsemen (Prussian military land-cavalry). In 1813. 603 – Fusilier shako of the Bavarian country defense. Order to 1830. With white pompom and white curtain. Shako cover of sheet metal. 617 – Hat of a staff officer of the Reuss contingent. Order to 1812. With black-red-yellow cockade and gold braid-lacing. 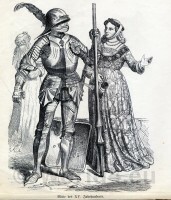 619 – Hat of a Saxon officer of the General Staff. With white (silver) cockade, gold lacing and a short red and silver tassel. Approx. In 1812. 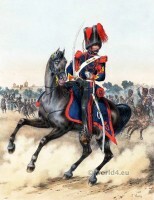 620 – Shako of a sergeant of the Saxon horse artillery brigade. Order to 1810. With red plume. Stood by Paunsdorf of Leipzig in October 1813 in the battle. 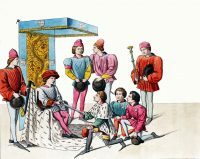 622 – Shako of the infantry of Schwarzburg-Rudolstadt. Order to 1820. 654 – horse collar with rich embossed leather ornamentation with which Austria’s double-headed eagle and the year in 1807. From the carriage park of the Emperor Francis I of Austria. Adoo Quamina in war dress. Ashanti Ghana. Varangian Guard. Viking Chiefs 5th Century. This entry was posted in 1810, 1812, 19th Century, Austria, France, Germany, Hat, Military and tagged Austrian military uniforms, French military uniforms, German Military Costume on 2/13/14 by world4.